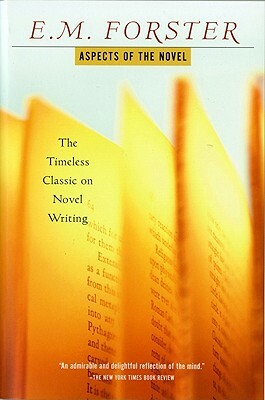 I just finished reading Aspects of the Novel, a compilation of writing lectures given by E.M. Forster. It’s a short and dense book on the craft of novel writing, filled with strong opinions. I loved it. In particular, I enjoyed some of Forster’s comments on the differences between novel writing and drama. I so often default to Aristotle and his concepts of what a story should be, yet I forget that the form of drama (a play) and the form of a novel are two different modes of communication. Interesting stuff, right? Most of these quotes come from the chapter about plot, but the whole book is quite wonderful. Structurally in terms of abstract story shape, Aristotle doesn’t really give us much of a pointer. He says ‘for every tragedy there is a complication and a denouement. By complication I mean everything from the beginning, as far as the part that immediately precedes the transformation to prosperity or affliction. And by denouement, I mean the start of the transformation to the end.’ So, it is really more of a two part thing, and he gives you no real sense of the proportion those two things should be in. It’s not actually tremendously useful. 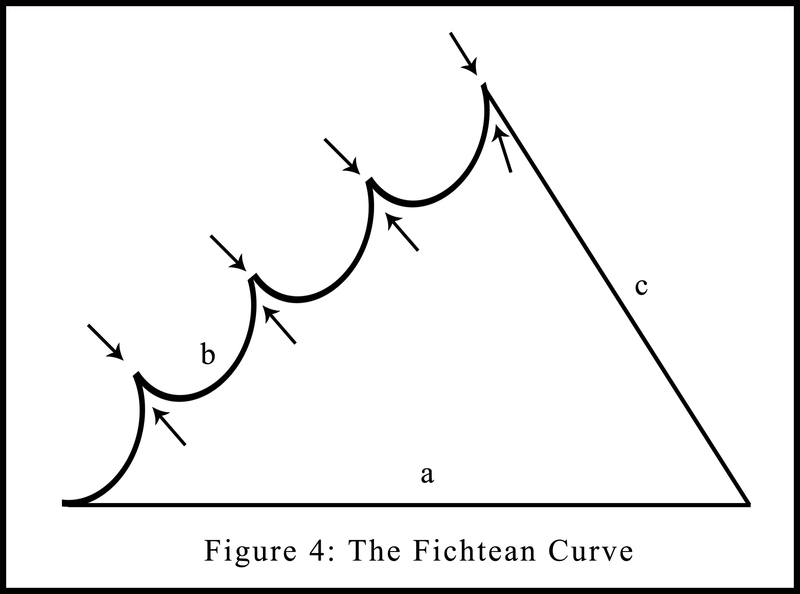 Thus the story shape (the Fichtean curve) came later as others developed new theories of plot structure. The emphasis on increasing tension and emotional involvement is perhaps why this is the most popular plot structure around, but it’s not the only option. 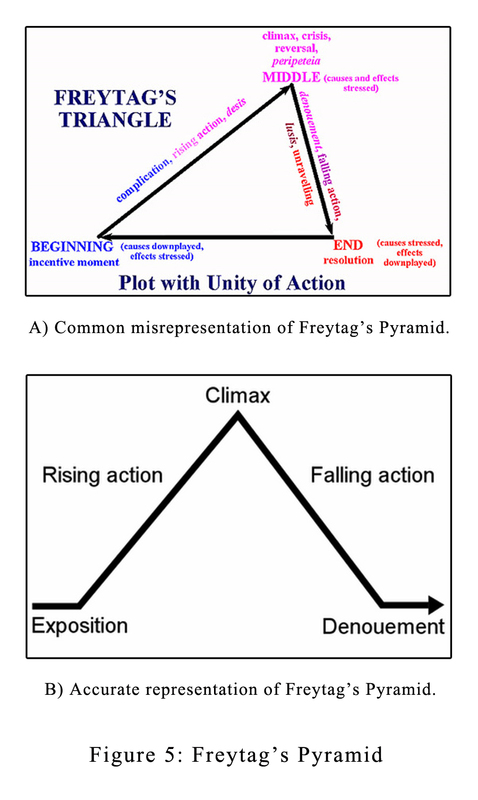 Author, An Na comments that the possibilities for plot and story structure “are about as plentiful as ways to cook food.” Taking a look at figure 6, which shows a plethora of alternative plot structures, one will begin to see she is indeed quite right. 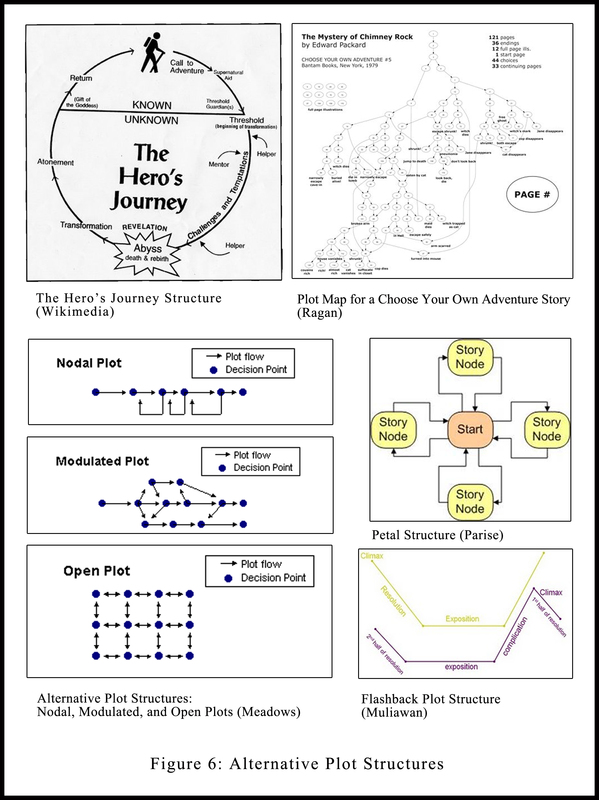 Alternative plot structures can be applied to both novels and stories, but they may become more popular as interactive storytelling is developed using video games, internet, and digital interfaces. 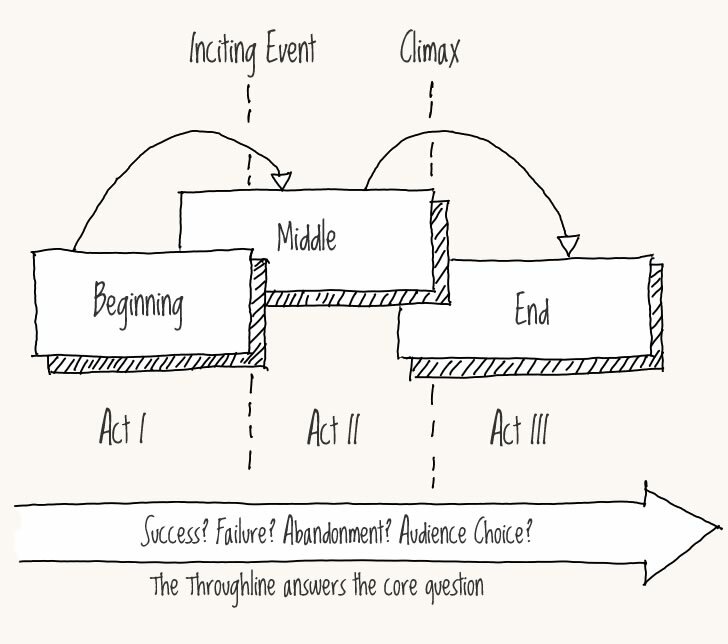 We’ve established that plot is the linear events chosen from the story and presented with a causal relationship. However, a writer might receive the comment: “This has no plot!” from a teacher, and the writer might then argue that he’s chosen events and presented them with profluence. This may be true, but it’s possible the teacher is referring to something more specific. 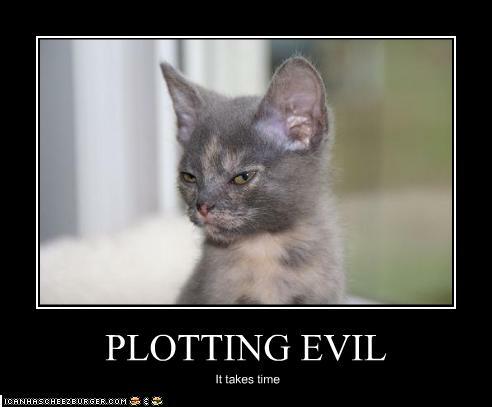 One of the major issues when it comes to discussing plot, is the use of the word “plot” and how it often refers to a specific type of plot. What plot is that? Why it’s the grandpappy of dramatic theory’s concept of plot, of course: Aristotle’s energeic plot. Energeia relates to action. John Garder says “the most common form of the novel is energeic” and by the word energeia “Aristotle meant ‘the actualization of the potential that exits in character and situation” (187). Philosophy professor Jeffrey Wattles explains Aristotle’s energeia as “when things are in activity,” further pointing out that “every activity is directed toward some good or goal.” And Klien explains that Aristotle’s tragedy is “a representation of a serious, complete action which has magnitude … represented by people acting and not by narration.” Therefore, when we speak of energeic plot we are talking about the action plot or the goal-oriented plot, where a protagonist has a goal and takes action to obtain that goal. This is the plot of Aristotelian tragedy, and the most common organizing principal used when plotting. This is the plot of The Hero’s Journey, it’s the plot taught in film school and found in myth and novel from contemporary times to the days of the Greeks. But is it the end-all-to-be-all of plot? The energeic plot may be the most common, but it’s not the only plot available to writers. In fact, film theorist Charles Ramirez Berg noticed an emergence of alternatively plotted films that don’t fall under the dominant energeic plot paradigm. He’s begun to classify films by new plot types and has come up with twelve categories, suggesting that this is just the beginning and not an all-inclusive list (8). A small sampling of his plot types include: The Polyphoic or Ensemble Plot: Multiple protagonists in a single location which is “characterized by the interaction of several voices, consciousnesses, or world views, none of which unifies or is superior to the others” (15). There can be goals in this plot type, but more often it’s a character-driven story in the form of a portrait of a city or group of friends (example: The Big Chill). The Daisy Chain Plot: No central protagonist, one character leads to the next. In this plot we follow an object as it switches hands from character to character (example: The Red Violin) (25). 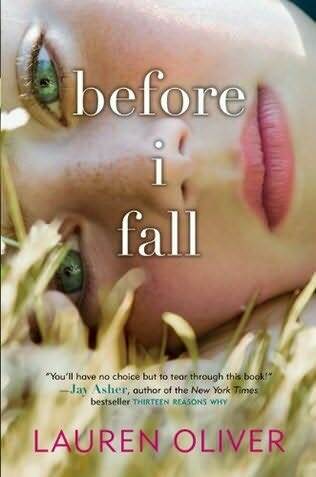 The Repeated Action Plot: One character repeats a single action, as in the film Groundhog Day or Lauren Oliver’s YA novel Before I Fall, where the protagonist re-lives a day of her life multiple times (30). As we can see, many types of plot exist, and though goals can be a part of these plots, it’s not the only way in which to plot a story. Another term to consider is that of the soft plot. Is this a new plot type or a reaction to a plot without much action? This is a tricky question as the distinction relates to the context in which the question is posed. I would postulate that most often a soft plot comment is a reaction to a slow energeic plot. “Lack of suspense or tension in a narrative can in part be explained by the absence of a tight plot. 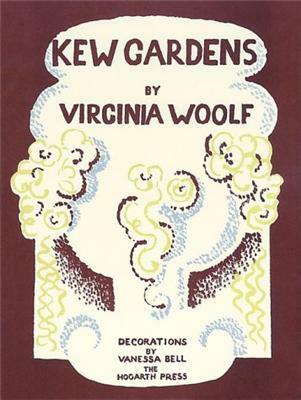 There is very little tension, for instance in Virginia Woolf’s short story Kew Gardens, mostly because practically nothing happens … Many modern and postmodern writers deliberately try to eschew event-dominated stories and tight plots because they feel it is not an accurate rendering of reality and they claim to be more interested in character than plot” (Basics of English Studies, 2). The reference in this quote to “tight plot” and a need for “things to happen” is a reflection of a desire for energeic plot, but the idea of being interested in authenticity and character has merit of its own. A character driven plot could be its own plot type as well, where the designing plot principal is to show causal events that create a portrait or context of a character and her life rather than a specific goal. It is here that we’ve begun to move away from plot. Here we have begun to talk about stories, but stories without plots. What we have here is a pattern of organization concerning a story that lacks causality and profluence (thus has no plot). What we’ve stumbled upon is structure. I’m currently working on an essay on the differences between narrative, story, plot, and structure. I promise to share all of my findings in the near future, including all sorts of graphs and alternative plot structures than the good old Aristotelian model. In my research, however, I came across a transcript from a lecture given by Scholastic Editor Cheryl Klein. If you are a little fuzzy on what Aristotelian plot is and how it manifests itself in YA and MG literature, I highly suggest checking out the links below. It covers all sorts of great topics including types of action plot, emotional plot, catharsis, and structure. It also uses great examples from YA and MG books! Don’t miss it! And it’s a great “brush up” if you already know about Aristotelian structure/plot.